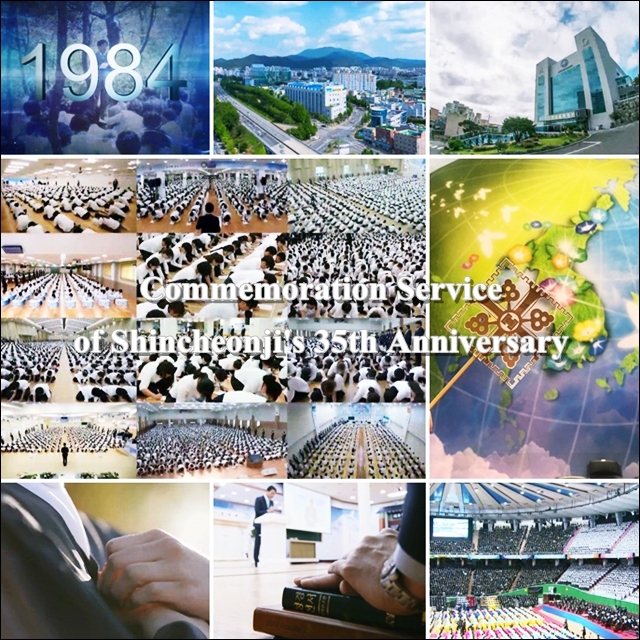 Born on March 14, 1984, Shincheonji Church is now 35 years old. They are younger than me..., but there are reasons why I have to admit it. In the midst of disregard for God and religion, the pace of growth and development of Shincheonji Church is so amazing that it does not shut its mouths. The Zion Christian Mission Center, which is a bible education institute, produced a total of 20,000 students, including Korea. More than 1,000 people from Europe, the United States, and South Africa last year, and this is the 'growth' that I must admire and admire. Nowadays, the number of churches in each church is decreasing day by day, and the place where the door is closing is increasing. 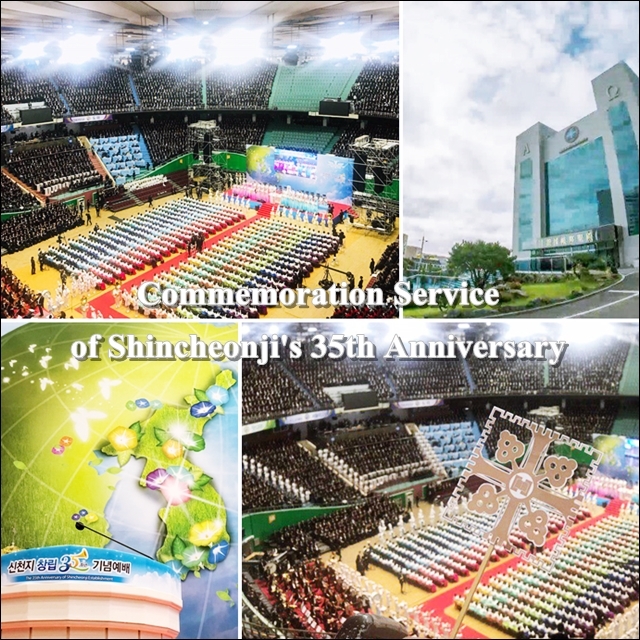 Though the number of years is 35 years, the number of churches in Shincheonji Church is steadily increasing every year. 2) The excellence of the Word and the Revelation are essential subjects. 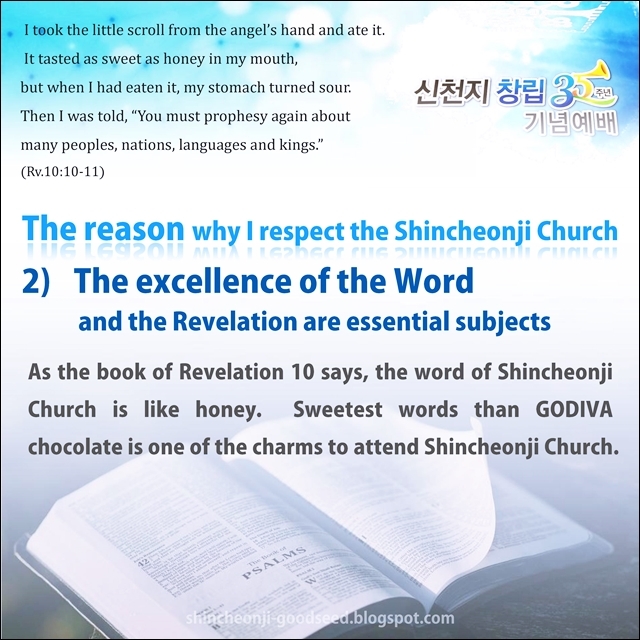 Sweetest words than GODIVA chocolate is one of the charms to attend Shincheonji Church. 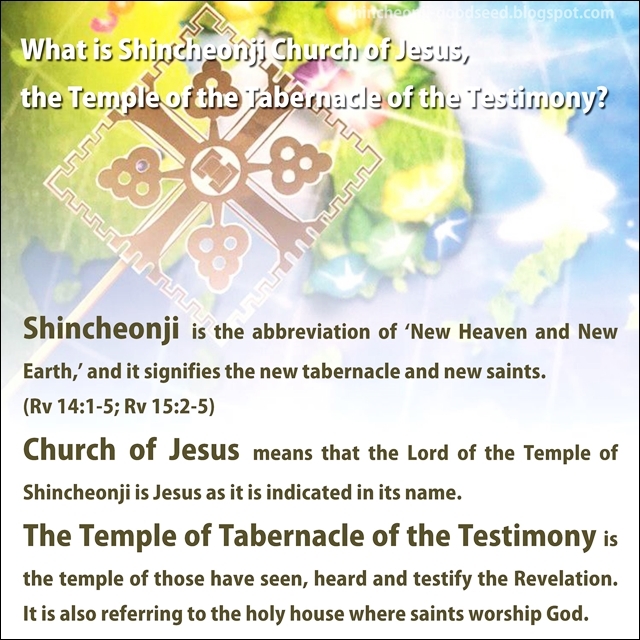 As the book of Revelation 10 says, the word of Shincheonji Church is like honey. 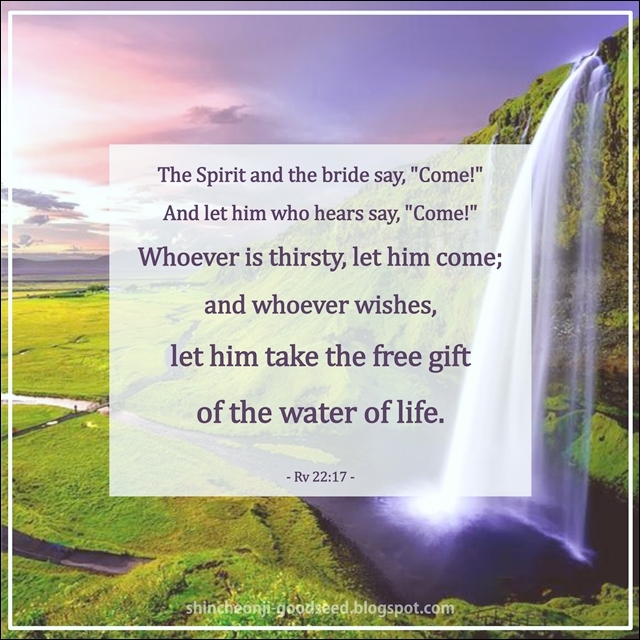 Because I have unlocked all the secrets of the Bible that have been hidden in the meantime, I cannot go anywhere else if I am hooked on the charm. And, instead of going to the seminary and paying the expensive tuition, we are taught by the Zion Christian Mission Center without paying the tuition, just as Jesus had promised. Because Jesus told me to return this word that I received without value, I am practicing it. Especially, Revelation lecture is the best truth of mankind. I know people who have eaten something delicious. If you read this article, you will be able to sympathize if you taste ‘the word like honey.' I’m so sad that I don’t have the ability to express it in words. Although other churches can join a church when they attend one day, Shinchoenji Church is only accepted for about one year after completing the theological studies and passing the examination. Although the process of studying is difficult, the Word is sweeter than chocolate, and the blessings of God and the taste of heaven can be felt. 3) Suffer persecution with thanksgiving and joy. A few days ago, Shinchoenji Church had a graduation ceremony with 314 graduation students. During graduation ceremony, Emilin (22), who is the representative of the graduates, read her letter of appreciation and it touched everyone who attend the graduation ceremony. "Since my childhood, I have been confronted with disease and have been sentenced to death. I did not have any fondness for life. 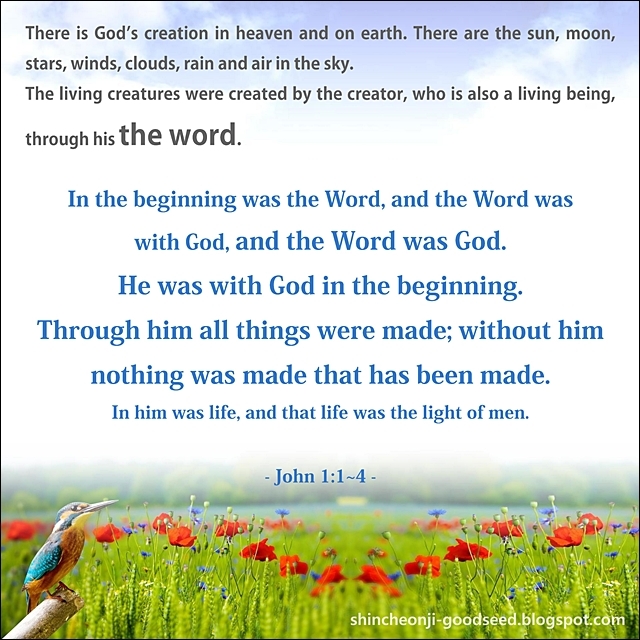 I did not believe in God, but I came to know the true nature of God toward the world through my missionary from Korea. This was the most powerful analgesic that made me forget my painful life and became the driving force for me." She spent her spare time learning the Word, and in the end she experienced a miracle that she was healed without surgery. Christianity is a religion of experience and I have to believe and acknowledge this word because I have had experienced. It takes 20 years to build a reputation, and it takes 5 minutes to break it. - Warren Buffett. Because of the impressions and gratitude that I have received, my heart has not changed in the unfounded rumors, periods, and persecutions for our church, and it has been able to grow until now. 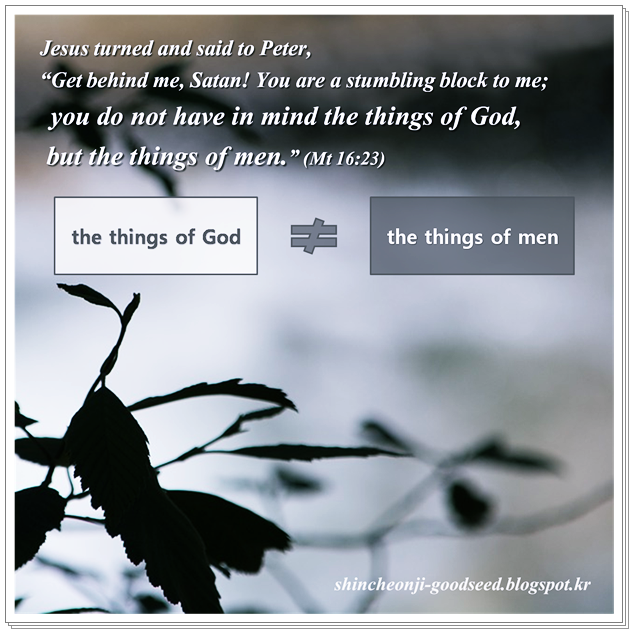 The constant Word of God and its values in Shincheonji Church were the witnesses of our lie, and the result of the testimony is the saints of Shincheonji Church. 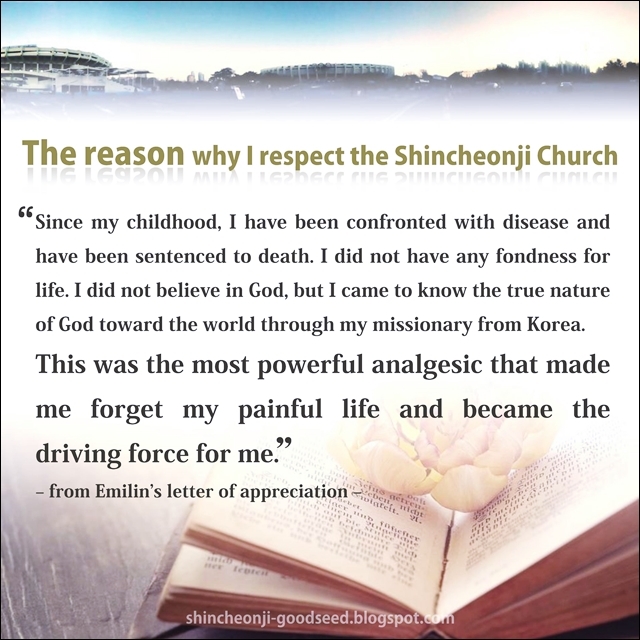 For these reasons, I am proud of the 35-year-old Shincheonji Church and thank God. I do believe. I believe that the Lord God of all things wants to save all of our humanity and that if we do that together rather than fight for different reasons, the world of peace will come true. You are the only one in the world that no one else can replace. 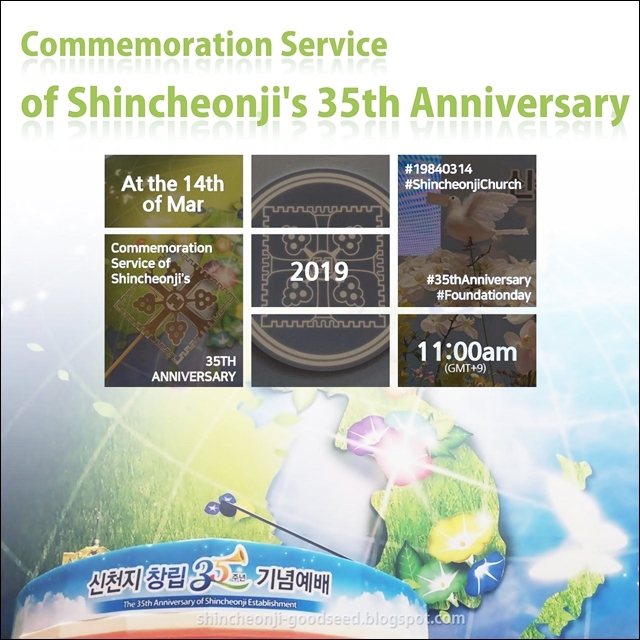 I would like to invite you to the 35th birthday of Shincheonji Church to share the heart of God with people who know the precious value of human beings. 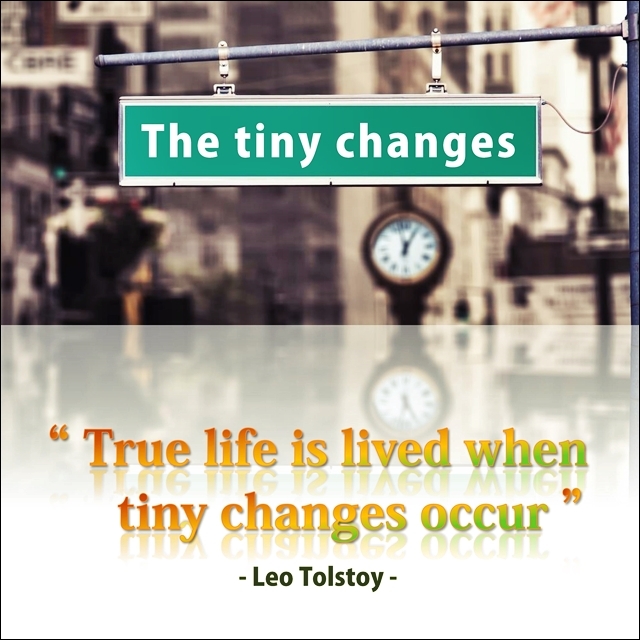 According to Leo Tolstoy "True life is lived when tiny changes occur." I would like to introduce to you some people who make tiny change. Last month, These people wearing yellow vests caused a tiny change in the old walls of Gyeonggi-do Bucheon-si Daejang-dong, S. Korea. For a neglected class of people, they came to the village to paint murals on the side of buildings under the title 'Dream'. Volunteers offers volunteer work to 3 households, which were selected, during 4 days. Shincheonji volunteers and 108 foreign workers worked together. Before they colored the side of houses, they filled the crack with cement, and weed the lawn for the wall full of dream. “Participating the Mural Painting makes me happy. Serving Volunteer makes me happy. Jonathan from Philippine shared how he felt after competing Mural Painting. 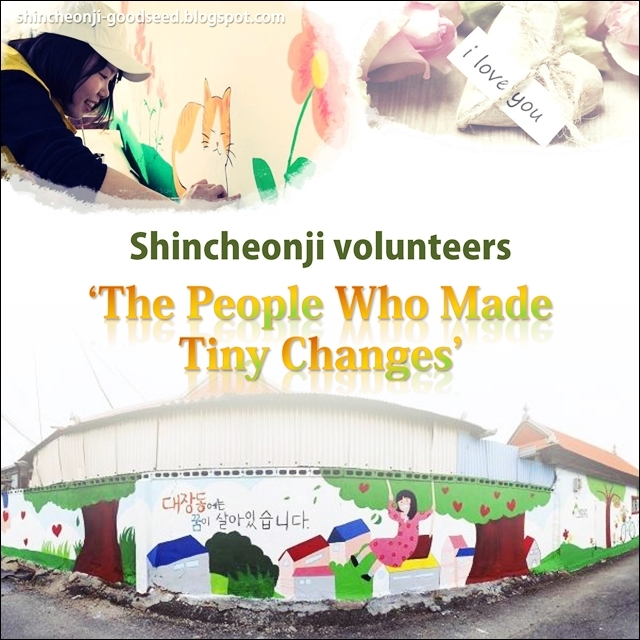 Shincheonji Volunteers were thanked and happy for the residents because they welcomed the volunteers. After the murals were completed, the volunteers were delighted to see the smile of residents. ▲A Cheer for a Hundred Years of Age (making healthy the old culture), etc. 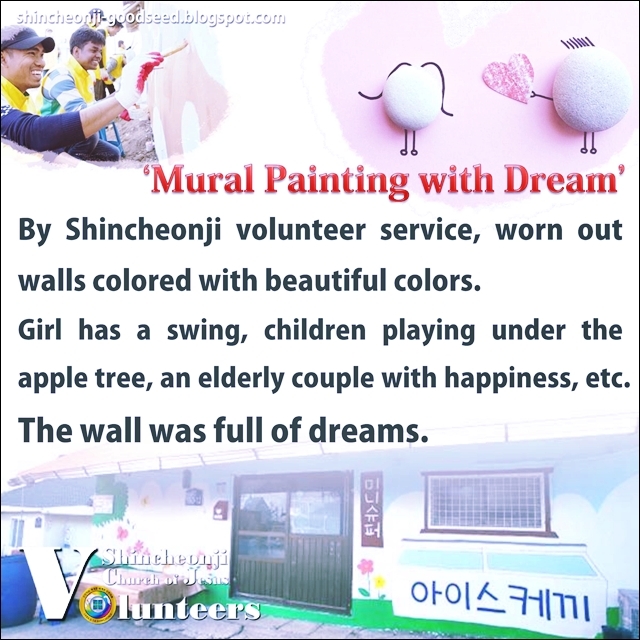 Shincheonji Volunteers will continue so, please give cheers for their various voluntary activities. There is a light from the sun during the daytime and there is light from the moon and stars during the night time. There are clouds and flying birds in the sky. There are animals, grass and plants on earth. Beautiful flowers bloom. It rains and snows on earth. In the sea, there are several different kinds of fish swimming. Alluring coral creates breathtaking scenery inside the sea. It is such a joy and an honor to be part of this wonderful scenery and to be able to live together with all creation all year round. 하나님께서 창조하신 세계 지구촌은 참으로 아름답다. 낮에는 햇빛, 밤에는 달빛과 반짝이는 별빛, 하늘에는 구름이 있고 새가 날고, 땅에는 짐승들과 초목들이 있고 아름다운 꽃들이 피고 비가 오고 눈이 내리며, 바다에는 각종 물고기가 왕래하고 아름다운 산호가 꽃 같은 풍경을 이룬다. 나도 춘하추동 아름다운 풍경 속의 한 존재로 만물과 더불어 살고 있음은 참으로 기쁘고 즐겁고 영광스러운 일이다. God’s creation is absolutely stunning and marvelous. It is heaven. In the harmony of heaven and earth and in the midst of all creation, I, too, become a delightful being. I become a flower and I become a butterfly. In fact, I am more precious than any flowers or butterflies. I’d like to become a living being of love just like the light, rain and air that are needed by all creation. I’d like to emit the true aroma of the living flower and become an eternal joy for all creation that everyone misses, seeks, waits for and needs. 너무나 화려하고 아름다우며, 이것이 천국이다. 천지조화 만물지중에 나도 보기 좋은 한 존재로서 꽃이 되고 나비가 된다. 아니, 나는 그보다도 더 소중한 존재이다. 나는 만물에게 필요한 빛과 비와 공기같이 사랑의 생명체가 되고 싶다. 너도 나도 그리워하고 너도 나도 찾고 기다리며 원하는 참 생명의 꽃 향기로 영원히 만물의 기쁨이 되고 싶다. 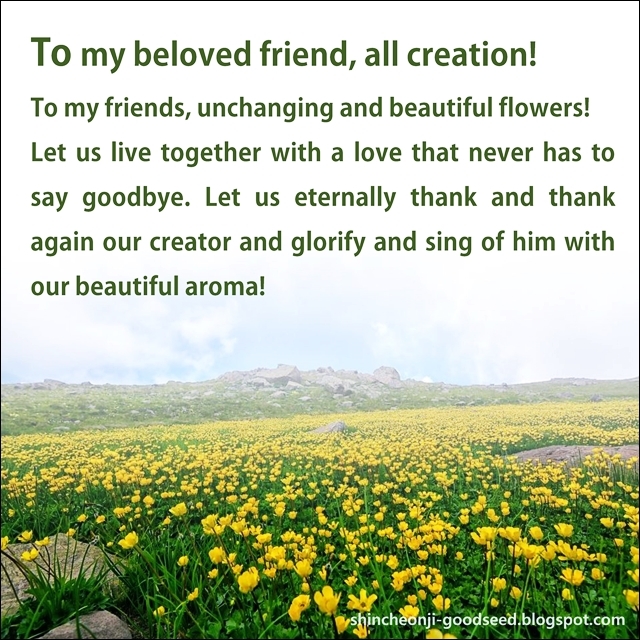 Singing like birds, dancing like butterflies, smiling like charming flowers, flowing like streams with a bright aroma, being like the morning smiles and smiling like the angelic and radiant moon, I’d like to smile, bloom and live with my friend in all creation forever and give thanks to our Lord. 내 사랑하는 친구 만물들이여, 아름다운 불변의 꽃 친구들이여! 이별 없는 사랑으로 함께 살아 창조주께 영원히 감사 또 감사하며 향기로 영광 돌리며 노래하리라. 지저귀는 새들같이 노래하고, 나비같이 춤을 추며, 꽃같이 아름다운 미소로 웃음 짓고, 밝은 향기 속에 흐르는 시냇물같이, 아침의 웃음같이, 천공(天空)의 아름답고 밝은 달의 미소같이 나도 웃으며 밝게 만물의 친구들과 함께 영원히 꽃 피우며 함께 살아 주께 감사하고 싶다. 하나님같이 예수님같이 서로 사랑하리라.